Took my car for a service today and an inspection, all good news as far as the engine and suspension is concerned but it flashed up with a fault code P0740. I got him to change the trans fluid as a matter of course, thing is I didn’t seem to have an issue with the tip, he’s saying the TC is as fault and I’m not doubting him but as I don’t have any symptoms I’m not likely to get the new box fitted just yet at a cost of £2.5k. What’s everyone’s thoughts? 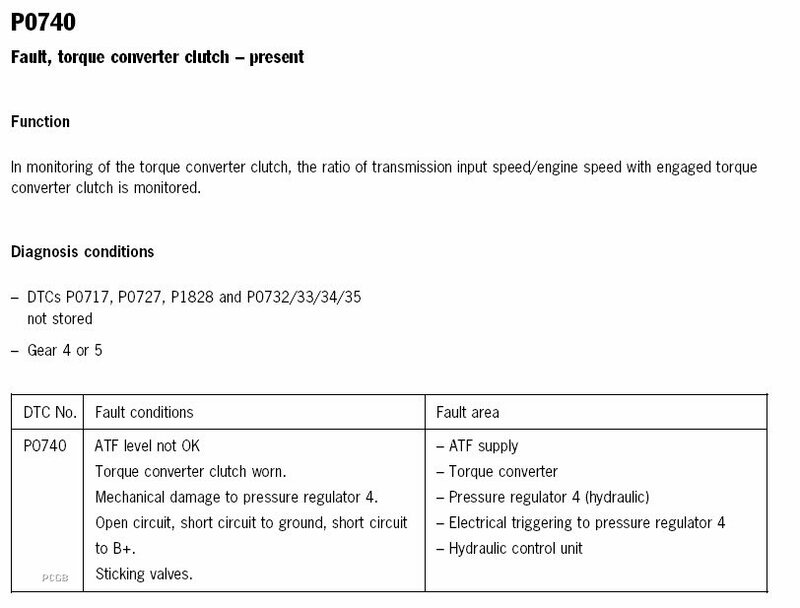 The fault code referes mainly to the Torque convertor lock up clutch . At a set Rpm you want a one to one ratio between flywheel and the gearbox .. upto this point it .. well .. it kinda slips like a manual clutch when your pulling away .. Details in the picture . Oil and filter is a good start along with the fact you havent had any problems .. also you can sometimes get this fault without actually having a problem .. a spurious code we tend to call them . For now i would suggest just drive and monitor it .. if there is a problem you will get repeated fault codes and the car will start to show symptoms . I guess if I drove another I might notice the difference but for now I shall monitor it and leave it till next year. Out of interest where did you have it serviced?